I am a Certified Hoop Dance Instructor with 6 years of hoop instructing experience. Hooping has totally changed my life in ways I hadn’t expected. The sense of joy and success that it brought would have been enough for me, but it went further than that. The joy of hooping was brought into my life before I discovered the benefits of hooping. Growing up unwanted in a family full of abuse, I knew at a very young age that life is not always kind. I decided to meet every challenge head on and become an overcomer of all obstacles in my life. At the age of 55, I was not surprised when I was diagnosed with osteoporosis … disappointed, but not surprised. Both my mother and grandmother had broken both hips by the time they were 55. Somehow, I thought I would escape, but it was not to be. The Dr. said that I would break a hip if I did not start medication immediately. My scores were extremely low for a 55 year old. I declined medication because of all the ill effects of taking it, and determined to start weight bearing exercise at the gym. After 2 years of consistent weight lifting combined with walking, I had another bone density test. Results — worse than the first one. The Dr. tried to force me to take the medication, but I had other ideas. I would just try harder – more weight lifting, diet, walking, etc. Determined to remove this obstacle in my life, I began my plan, but it wasn’t working the way I envisioned. Rather than succeeding, I started falling into a deep pit of depression with no way out. The exercise and diet started falling by the wayside, even though I knew that my life would be over if I broke a hip. The experiences of my mother and grandmother were still very fresh in my mind. I didn’t seem to care anymore, and certainly did not understand that the news from the bone density test had hit me harder than I thought. Then one day I saw a lady hooping on TV and decided to try it. Not realizing what was in store, I threw myself wholeheartedly into it. The joy was immediate, but the osteoporosis obstacles that had to be overcome — pain, bruising, uncoordination, weakness, tripping, twisted ankles, – took more than a year. Waist hooping alone took me 7 months to learn. I started hand hooping at the same time that I started waist hooping. That gave me a feeling of success and took my mind off my failures with waist hooping. But, the joy is what really kept me going and pushing myself to learn more tricks. The more I learned, the more joy I felt. The osteoporosis pain started subsiding after the first year of hooping. It was and still is a struggle, but my entire body has started feeling stronger. I hooped consistently for one year, then went for another bone density test. The doctor said my wrist bones were like a 35 year-old and my hips and back showed no further loss of bone mass. I was ecstatic … and the joy continues. God has blessed my life with hooping and I am truly grateful. I love sharing the joy of hooping with others through teaching and tutorials. It’s especially gratifying to see that joy spread from face to face. Today, at 64 years old, it is still a struggle. With age comes more problems that require working harder with the osteoporosis. I am determined to maintain good health … I am already 9 years ahead of my mother who broke her first hip at 55. Thank you to Urska for verbally expressing the way I’ve felt my entire life. I am honored to be part of her Ted Talk video below. Please share this video with everyone you know. We want to bring hope to all of the people who feel the same way we do. We are the ones in the back of the class who are too embarrassed to try because we are not the swans. I was born clumsy and no matter how many hoop skills I learn, the clumsiness will never go away. It will be with me as long as I live and people will continue to make fun of me, because they don’t understand that clumsiness is part of who I am. At 61 years old, I have finally discovered who I am, and, perhaps more importantly, who I am not. I am not, nor will I ever be an elegant, graceful swan. I am Hoopdeedoo, the happy hooper, bubbling over with joy. When you see me hooping in person, you will see my hoops flying everywhere. This only adds to my joy, because I know I have conquered the clumsiness … not by getting rid of it to become “perfect,” but by embracing it as part of who I am … an imperfect person full of joy. For me, hooping is all about the joy. It is a joy that God poured into me when he gave me the gift of hooping. It is a joy that I want to spread to everyone. It is a joy that has become my strength. Look for Hoopdeedoo at 9:17 on the video. Special Thanks to Mina Liu for filming, editing, and producing this video. Kudos to my star student Jennifer. Without her there would be no video. Pam, the gains you’ve made in treating your condition are amazing! Is hooping your only form of exercise now or do you do other forms of cardio or strength training. I’ve been working out consistently for over 20 years, and I’ve always loved it. (I’ve rarely been bored by working out!) However, since I started hooping in April of this year, I wake up each morning and have to fight the urge to pick up my hoop in favor of my morning workout! I still love my workouts and will always do them, but I’d like to cut back on them a little to allow more time for hooping. I’m just afraid that at my fitness level, hooping alone might not be enough in terms of cardio or strength training. When I hoop, I start and stop so much learning things that I really don’t get a sustained elevated heart rate, and I can’t see that the light hoop I use (less than a pound) can give me the same toning and strengthening benefits as using weights. Thanks for your comment. I generally hoop about 4 times/week for about 1 hour. Except for one back strengthening machine at the gym, I do hooping exclusively. 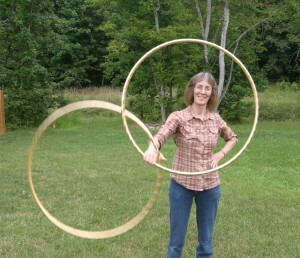 Since I started hooping, I have learned a lot about the weight bearing aspect of hooping. The hoops have weight themselves, but the spinning motion on your body and hands creates more weight. That is why it seems to be such a good form of exercise for osteoporosis. I did not get the same results when I did weight lifting at the gym. I know what you mean about starting and stopping during the learning process. When I start a practice session, I usually start with hooping everything that I already know. Then I practice new moves and finish with more hooping that is easy. Everyone is different with the hooping. People combine many other forms of exercise with hooping … weights, dance, yoga, pilates, ice skating, even horseback riding! Whatever makes you feel good about yourself. Once again thank you for the amount of detail you include in your videos. I work with older adults (mostly woman) teaching them weight bearing activities to help stave off the effects of osteoporosis. I’ve been hooping for 3 years now and I feel like hooping should help prevent osteoporosis. I am glad to read a testimonial to that effect. Now if my clients would just be a little daring a try the activity with me.